JomaDeals is a daily deal site that is owned and operated by Jomashop which is a retailer of luxury items that has been in business since 1987. 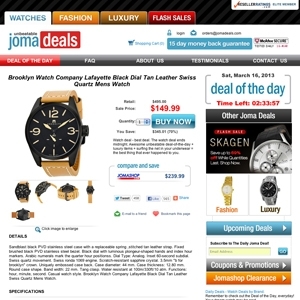 JomaDeals features 4 deal categories: watches, fashion, luxury and flash sales. The deals last for a period of 24 hours unless they sell out first. Jomadeals.com currently ranks #91 amongst sites offering online deals -- Chainlove ranks #90. In the General Merchandise category, JomaDeals ranks at #31 -- 13 Deals ranks #30. Amongst all deal a day sites, JomaDeals ranks #14 -- Chainlove ranks #13.